I know there is hype around truffles/truffled things and how awesome or overrated or expensive they can be. I know you have to be careful when buying truffle oil because most of the time it’s a big trick and there are barely any truffles. Not to say I am entirely against being tricked. I’ve definitely shelled out $$$ for things not remotely worth their price tags and I just can’t care. I can’t care about things I can’t care about. I CAN care about things that taste amazing and that is why I recently devoured some Pappardelle with Truffles and Sautéed Shrimp. 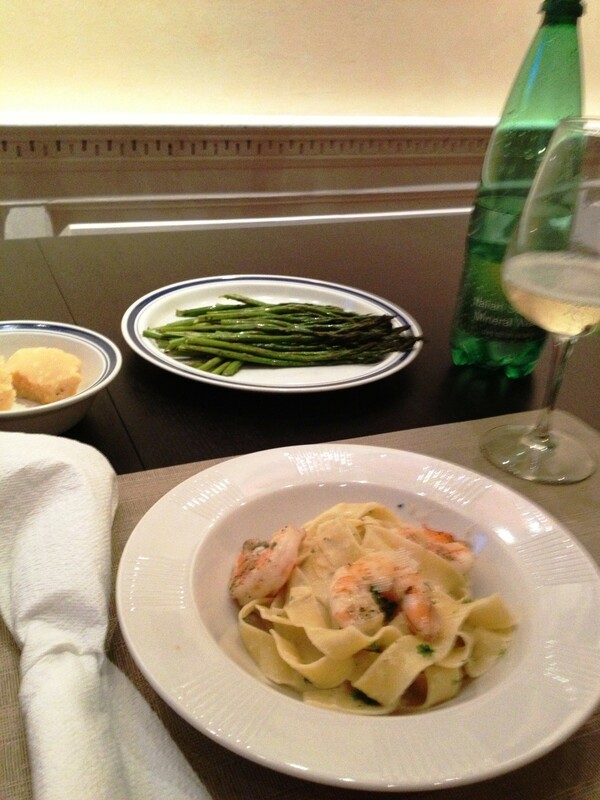 This is adapted from Ina Garten’s Tagliarelle with Truffle Butter. You seem suspicious. Like maybe you know Ina and I are scamming you into making something you’ve made 2357823095823 times but with the addition of “truffle” in the title and the use of a hard to pronounce pasta. You’re good. It’s fettuccine alfredo. Honestly are you mad though? How good is fettuccini alfredo? Plus truffles? 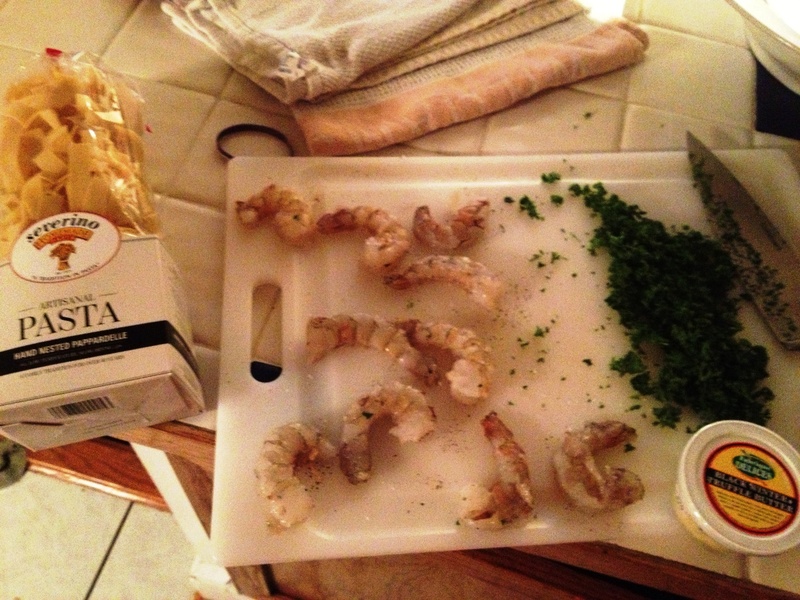 Plus (in my case) shrimp? What? What else can you WANT? 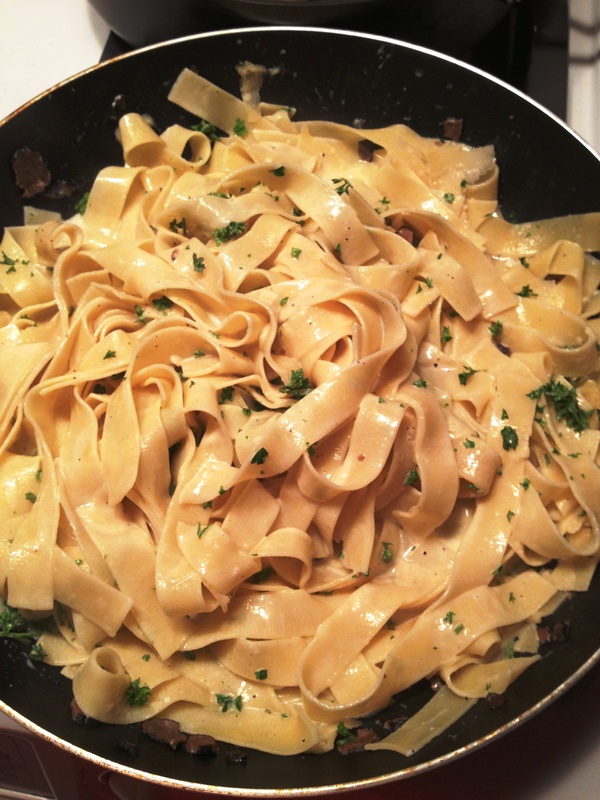 So essentially you could make any fettuccine alfredo recipe but use truffle butter instead of regular butter. Mine is similar to Ina’s but I used half and half instead of heavy cream, parsley instead of chives, black truffle instead of white truffle butter (easier to find/cheaper) and added shrimp. Boil a large pot of salted water. In a large sauté pan heat the half and half (really cutting calories by not using the heavy cream in this dish…oh wait) over medium heat. Reduce the heat to low and add the butter/salt/pep and stir occasionally until the butter is melted. Heat olive oil in separate sauté pan over high heat. Salt/pep the shrimp and sauté in oil until pink/cooked (roughly three minutes Cook the pasta until al dente (it will cook a little more in the sauce) and add to the cream mixture (reserve 0.5 cups of pasta water if you feel it needs to be thinned out- I added 0.25 cups of pasta liquid to the sauce…let the sauce and pasta hang out over low heat for a bit so they become friends). Add parmesan and parsley. Remove from heat and add shrimp. You could easily do this with chicken/salmon/whatever your heart desires. 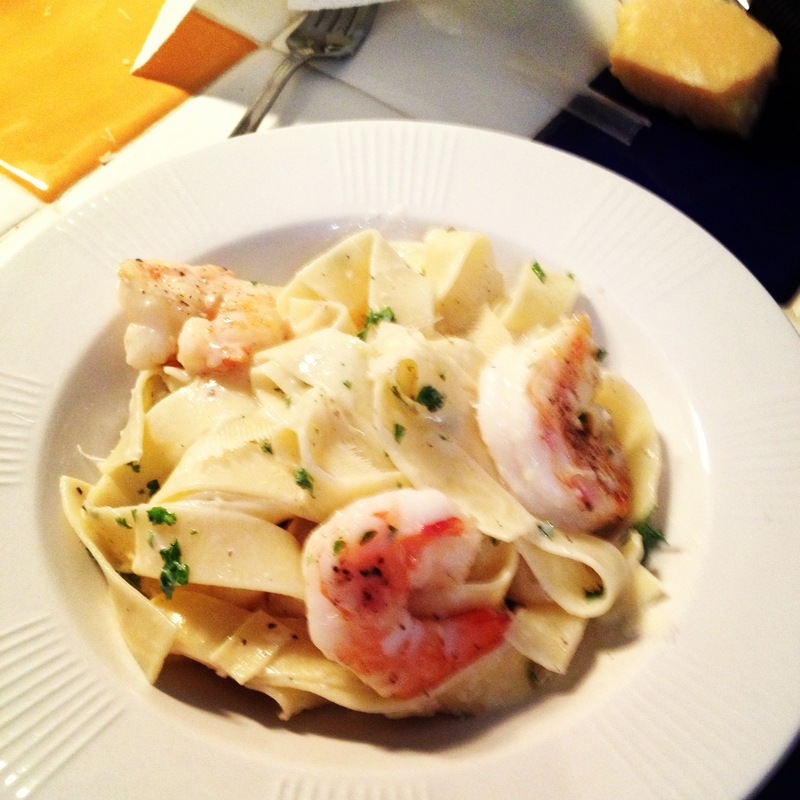 Either way makes an insane fettuccine alfredo.